Going for regional electricity markets instead of an EU-wide market comes at a cost. The single electricity market can significantly reduce the cost of supplying power to European consumers, as recent studies by Booz et al and Bruegel have shown. However, comprehensive market integration is held back by the major differences in energy systems, consumer preferences and industrial structures in the 28 EU countries (see for example Ahner, de Hauteclocque and Glachant, 2012). Consequently, a discussion is emerging on whether intergovernmental agreements between a limited number of member states in certain areas of EU energy policy could be a more promising path to the achievement of a European energy market, compared to the currently envisaged Europe-wide implementation of an undifferentiated ‘target model’. Proponents such as Groot and Jong (2013) claim that intergovernmental agreements between the most similar member states are politically easier, because (i) the distributional effects of harmonising rules are smaller in more homogenous regions, (ii) smaller groups of countries can more easily find compromises, and (iii) the ability to leave unwilling partners behind allows more ambitious integration of those member states that wish to move forward (see for example Andoura, Hancher and der Woude, 2010, p105f). On the other hand, a multitude of regional arrangements can create a regulatory mess when national and European rules and authorities are complemented by overlapping regional rules and authorities. Furthermore, diversity in terms of resources and preferences is probably the most important driver of the benefits of integration. To illustrate this, we compare the benefits of integrating two neighbouring systems with the benefits of integrating two geographically distant systems. 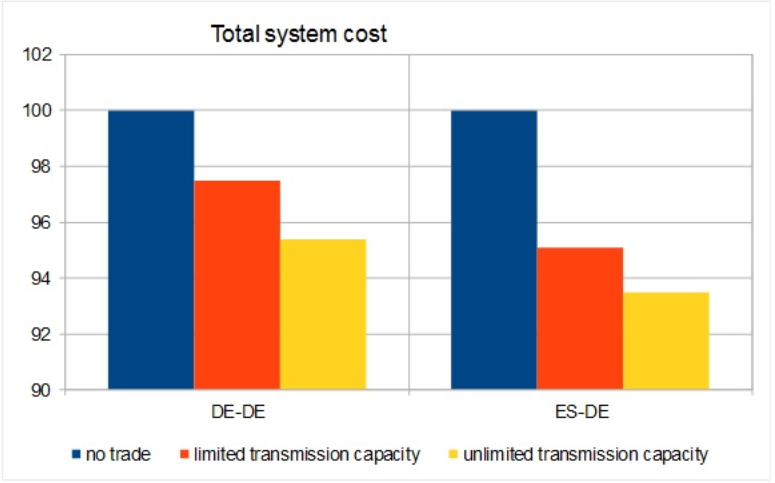 In our recent blueprint, we analyse the total cost of two electricity generation systems (operational and capital cost of the entire power-plant fleet) given different levels of interconnection between them (here you can find the R code and the data). The example of the two neighbouring systems is based on hourly solar and wind feed-in and electricity consumption in two neighbouring German transmission zones (Amprion and TenneT). Because of the proximity of the two systems, the correlation of renewables feed in was 67 percent and the correlation of the residual load (consumption minus renewables) was 74 percent in 2012. The total cost of the two systems without interconnection is set to 100 (given that their fossil power-plant fleets are individually optimised to meet demand in their respective zones at a certain level of renewable deployment). At limited transmission capacity (5 percent of the peak consumption in the smaller market), the cost of the total system can be reduced by more than 2 percent. At unlimited transmission capacity this benefit increases to 4.6 percent. The benefit of integrating two distant systems is significantly greater. Our example is based on hourly solar and wind feed-in and electricity consumption in Germany and Spain. Renewables feed-in patterns are relatively uncorrelated (18 percent), and residual demand correlation is also substantially lower at 59 percent. Again, the total cost of the two isolated systems is set to 100. Already limited integration could reduce the total system cost by almost 5 percent. At unlimited transmission capacity, by jointly optimising the deployment and usage of fossil plants over great distances, 6.5 percent of the total system cost can be saved in our simplified example. That is, the benefit of integrating two distant systems is more than 40 percent greater than that arising from the integration of two neighbouring systems. This implies that distant countries with high shares of uncorrelated renewables benefit most from market integration. Finally, it should be noted that the cost savings we have calculated do not include the benefits arising from a coordinated roll-out of renewables, from allowing for a wider portfolio of technology options (eg efficient vs. fast units), from coordinated storage usage or from increased competition between generators. Most of these benefits will also be greater for integration involving distant countries than for integration of neighbouring systems.